My cute sister had twins last fall and they are the cutest twins ever. I really have no idea how she handles them both, I helped babysit with my mom and Husband there and it was still a handful. 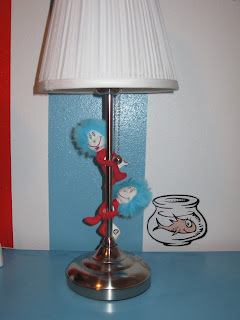 For a while now, we have been planning how to decorate the Nursery. 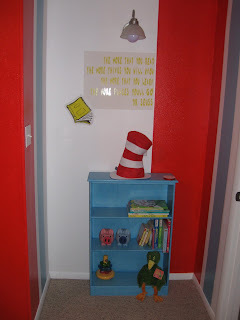 Since she has a boy and a girl we decided that a Dr. Seuss Nursery would be perfect. 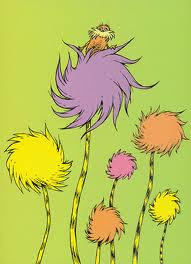 Don't you just love Dr. Seuss? The magical words to his books, the fun colors and characters, it makes for a very inspiring baby nursery. It took us a while to get it all started, she changed rooms around and finally got them moved downstairs next to her room. This is the room before... Very plain white walls. We did put a fresh coat of white paint on the walls and ceiling since it had been years since it had been done. 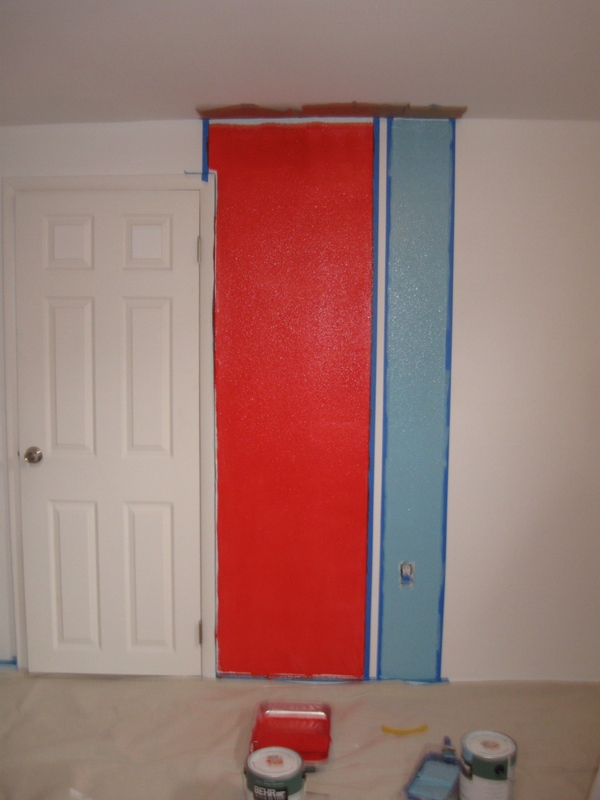 It took a few hours to get it all taped out and set just right. Now on to painting the stripes. She had the paint colors matched from the Cat in the Hat book at the hardware store. 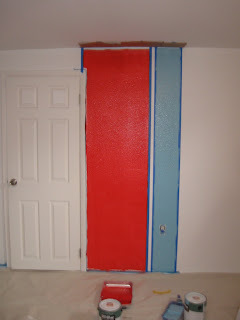 We used Red and Blue. Then it was time to start decorating and placing everything in the room. She bought some Fabric for the draperies and some poster cut outs of the characters from all the different Dr. Seuss books. The dresser was previously painted a dark green, she repainted it the same blue as the walls and glazed over it with a little darker blue. I think it turned out awesome. Since her walls are very textured, we made Vinyl sayings to go on the wall, but put them on a white board first. This is a small reading nook on one side of the room. She has a toy box/bench that will go in this corner but we are still working on getting it painted. She is also making these cute blankets for each of them. Being inspired by the trees in the Lorax. 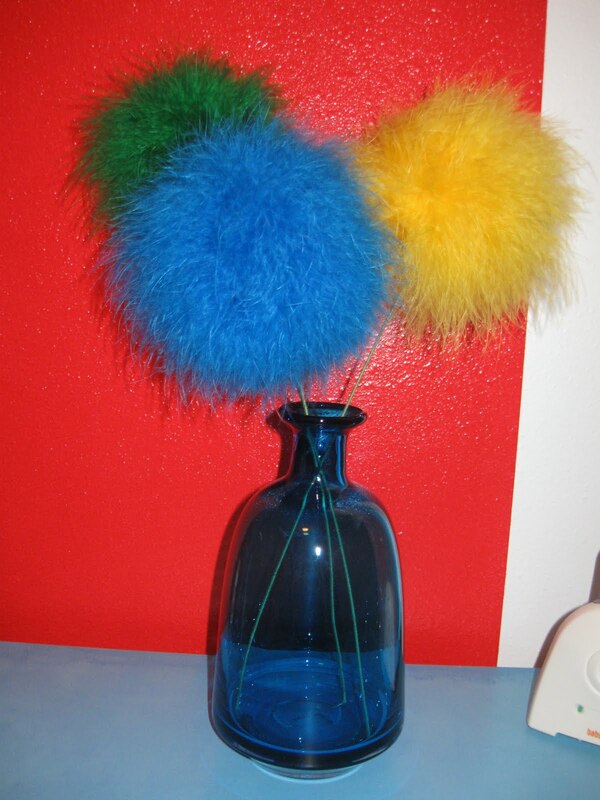 My sister came up with these cute decorations. She used Styrofoam balls and wrapped a feather boas around them. I think they are the cutest idea, it is my favorite part of the room. It was so fun to work on this little room, it was easy to be creative and just think outside the norm as the true Dr. S. would do. What a fun room for these little ones to explore as they grow. great post! I haven't even blogged about it yet. I might need to get copies of some of those pictures. It was so fun to do, but I am glad it is done. Thanks for all your help!